Jones tells us what it was like growing up on a Virginia tobacco farm. Maurice Jones is Gov. 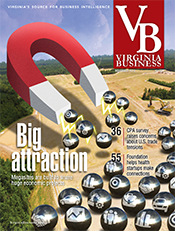 Terry McAuliffe’s point man in the administration’s efforts to transform Virginia’s economy. As secretary of commerce and trade, he oversees 13 business-related agencies — including the Virginia Economic Development Partnership — and is the chairman of a Cabinet steering committee coordinating state agencies in pursuing the administration’s economic development strategy. Jones, 50, comes to the job with a diverse background in the public and private sectors. Before joining the McAuliffe administration, he was deputy secretary of the U.S. Department of Housing and Urban Development for nearly two years. 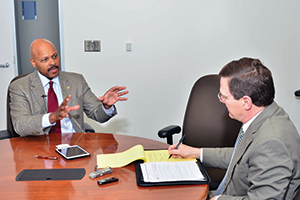 He also has been publisher of The Virginian-Pilot newspaper in Norfolk, commissioner of the Virginia Department of Social Services and deputy chief of staff under Gov. Mark Warner, a Treasury Department official under President Bill Clinton, a lawyer in Richmond at Hunton & Williams and a partner at Venture Philanthropy Partners, a firm that invests millions of dollars in the Washington, D.C., area in helping low-income children. His grandparents, James and Rosa Hatchett, who raised him on a tobacco farm in Lunenburg County, are foremost in a group of people Jones describes as game changers in his life. 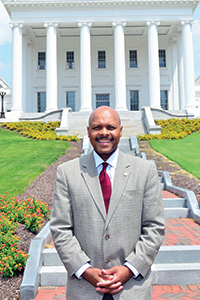 The group includes an eighth-grade science teacher who arranged for him to become a page at the General Assembly in Richmond and later helped him win a full scholarship to Hampden-Sydney College. He graduated first in his class at Hampden-Sydney. Jones credits another “angel in my life,” Josiah Bunting, then president of Hampden-Sydney, with helping him win a Rhodes Scholar scholarship to Oxford University where he earned a master’s in international relations. He later received a law degree from the University of Virginia. In addition to traveling up and down Interstate 64 every day, Jones also travels with his daughter as she pursues her passion, AAU basketball. “I’m one of the coaches of her team. So I spend a lot of time frankly following her to basketball games,” he says. 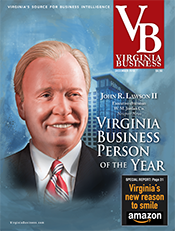 Virginia Business interviewed Jones on Aug. 21 at his office on Capitol Square in Richmond. The following is an edited transcript. 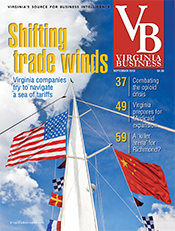 Virginia Business: You’ve held a wide variety of jobs in the private sector and in government. What attracted you to this position? Jones: I’d say two or three things. One, I’m a native of Virginia, so being able to be in public service in Virginia is an attraction to me. And this is sort of my second tour of duty. A third is the chance to work with this governor on these challenges. It was for me apparent that this was something that, for him, was going to be a priority and, frankly, that he was going to be an unbelievable asset in this whole space. For all of those reasons, I thought this was an opportunity well worth going for. VB: Now, given your background, do you feel like you bring a unique perspective to the economic challenges facing the state? Jones: I want to stay humble with that. I think what I bring is a combination of public- and private-sector leadership experience. I also bring the most formative experience of my life, which is growing up in Southside Virginia … Because I’m a native of Virginia and because I’m a son of Southside, I bring a passion for working on these economic development issues. That’s what I try to bring to the game every day. VB: Do you have any sort of particular goals as far as numbers of jobs created or businesses recruited during your term? 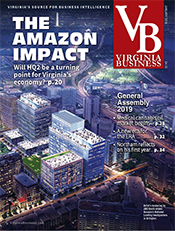 Jones: The big goal is to help to reposition the engine of economic growth in Virginia away from the public sector and more toward the private sector. That’s the big theme of our journey. It really is diversifying the economy … so that the long-term trajectory is a more balanced one where our engines of growth are both public and private, and that the public is not so dominant. That doesn’t mean I don’t want to keep the public space. We want to grow the private [sector]. This is a cause that will outlive my few years [as secretary of commerce and trade]. But if I can contribute with the governor to that repositioning, it will be a job well done. VB: What is the [administration’s] economic strategy? Jones: There are five strategic areas that we’re trying to focus on. One I would put under the theme of infrastructure. By infrastructure, I mean such things as a 21st-century energy policy, which enables us to keep our energy prices, particularly our electricity prices, the most competitive in the country. You cannot do economic development without competitive energy prices. Broadband, by the way, is part of infrastructure: broadband expansion in rural Virginia — we’re in dire need of that. 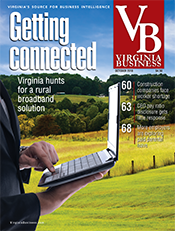 In most parts of rural Virginia, [there is] no more than 25 percent penetration for broadband. A second area of focus of the strategy is targeting high-growth, high-wage sectors — attempting to intensify our focus on cybersecurity, advanced manufacturing, information technology (particularly in the health-care space), energy and life sciences. Those are some of the areas where we really want to target growth. Third area: workforce development. You’ve probably seen what we’re doing there. We’re finding the biggest opportunity to add value is … by producing licensures, certifications and apprenticeships for those jobs that don’t require a four-year degree — in most cases don’t require two-year degrees — but do require post-secondary training. The fourth area of real focus for us is entrepreneurism, with incentives and policies to enhance the entrepreneurial ecosystem in the state so that we’re not only just the best state for business, but we’re the best state in which to launch a business. The last area is the overall business climate. We need to keep it really, really competitive. We need to have more tools in our incentive toolbox. We need to keep our corporate tax rates low. We need to keep our regulations lean and smart. Those are the five pillars of the strategy for us. 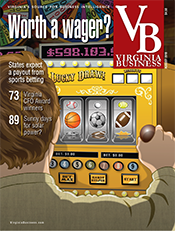 VB: North Carolina recently has cut its corporate tax rate [from 6.9 percent last year to 6 percent this year]. Is that something that should be examined in Virginia? Jones: I think we always have to look at our tax rate. 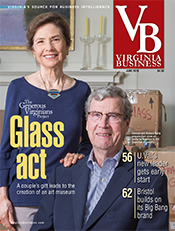 Virginia’s corporate tax rate hasn’t changed since 1972. Our tax rate [of 6 percent] actually is one of our attractive features. But I say that we should always be looking to see what our competitors are doing. I wouldn’t just single out taxes. Taxes are a part of a bucket I would call cost of doing business. 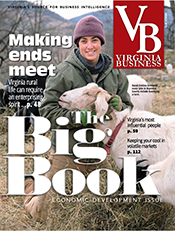 So the real question is: Can Virginia offer a lowest cost of doing business environment for our businesses? Taxes are one part of that. Fees are another part. Regulatory framework, that’s another part. All of that is part of the cost of doing business. And we have to be a lowest cost provider to stay competitive. We’ve got to look at all of that as we’re trying to woo and keep and help launch businesses. VB: Virginia’s unemployment rate is relatively low, but it has been creeping up in recent months. Some economists are saying it’s because of the reduction in defense spending … Do you agree? Jones: It’s not just defense spending … If you looked at the top 20 employers in Virginia, you know what you would discover? 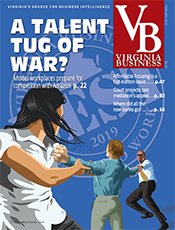 You would discover 13 of the top 20 employers in Virginia are either public sector — and that’s state, local or federal [government] — or they’re contractors to the public sector. That means there are seven out of the top 20 that are in the private sector. So, yes, the economists are right, but it doesn’t tell the whole story. The whole story is — I hate to use this analogy because somebody is going to be upset with me — a Denver Broncos challenge. Peyton Manning is their offense. If Peyton Manning is having a good game, they win. If Peyton Manning has a bad game, they lose. With us, the analogy is the public sector is our offense right now. If the public sector has a good season, we’re good. If the public sector is in a season of contraction, guess what? So, they are right that the federal plays a big piece of this. And the federal plays a big piece because not only is it the number of jobs, it’s the wages. Federal wages are healthy … We need more balance in our engine of economic growth … We need to catalyze private sector, nonpublic-dependent growth. 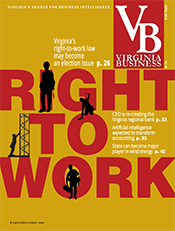 VB: Is there any particular initiative on your part or the governor’s addressing issues in Southern Virginia and Southwest Virginia? Jones: There’s a yes and a no answer. Each one of our regions, I believe, has assets that will enable it to attract particular sectors. That southern part of the state is a particularly attractive area for manufacturing. We are hustling, attempting to woo advanced manufacturing businesses, in particular, to the commonwealth. And our biggest success was the Tranlin deal out in Chesterfield [where a $2 billion, Chinese-owned paper plant eventually will employ 2,000 workers]. But we also just announced three deals out in Grayson County, all in the manufacturing space. That’s the big opportunity also in that part of the state. [It has a] low cost of doing business. It has a workforce that has a great work ethic. It’s also a workforce that has had manufacturing experience. I think another opportunity for that area frankly is tourism … Tourism is a big generator of economic activity in the state. Last year alone: $21.2 billion in expenditures, 210,000 jobs. That area hasn’t fully exploited its tourism assets. It’s beginning to — parks and trails, etc. And tourism generates other businesses. 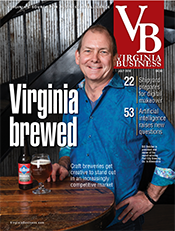 So, you’re going to see us next year, more likely than not, having a real focus on tourism in … I used to call it Southside Virginia … they’re calling it Southern Virginia now. The other piece is the workforce piece. Workforce development in that part of our state will be indispensable for economic growth. VB: Will your background enable you to work with the federal government? Jones: Oh yes ... I have a number of relationships there that will enable me to hopefully get some things done with the federal government. The federal government still is a big player for us, and we still have lots of business to do with it. And I’m hopeful that the relationships that I have will be helpful in that regard. The other thing — having a working knowledge of the federal government — I think, has been helpful for me in this job. No question. VB: Do you have any desire to run for public office yourself? Jones: That’s not a decision I can make without my big bosses — my family. I don’t think about public office in the context of running versus not running, to be honest with you. I think about it in the context of: Is the job a job that would afford me an opportunity to actually do some good? There are plenty of jobs in government that are not appealing to me. So, I’m not contemplating running for any public office now, but I’m also not ruling anything out. VB: I also want to talk about your background [growing up in Kenbridge in Lunenburg County]. My grandmother finished 11 years of school. At that time, you could graduate, 11 years. I went to live with them when I was 3 months old, and that’s where I remained. ... I tell everybody, if you want to inspire a child to go to college, put them in a tobacco field. VB: And as I understand it, a high school teacher helped you apply for being a page here at the General Assembly. Jones: Actually, it was my eighth-grade science teacher … This is the beauty of a place like Kenbridge, a small town, with 1,200 people. My eighth-grade science teacher [Barbara Palmer], one day after a debate match, … said, “I want to introduce you to somebody,” and she introduced me to the senator from that area, a guy named Jim Edmunds. And she said, “The senator and I were talking about your being a page.” I’ll be honest with you, I’m a country boy. The only pages I knew were these [sheets of paper lying on a table]. ... How can I be a page? She marched me off. She told my coach, “He won’t be at practice today.” She sat me down in the afternoons after school, and I applied to college. Now, little did I know she already had in mind the college she wanted me to go to. I was applying to Georgetown. This is what a young guy is thinking about, why did I apply to Georgetown? They had a great basketball team. You’ve got to apply to Georgetown! Then I applied to William & Mary. I got a full scholarship from Hampden-Sydney. I tell you why I got that full scholarship. That eighth-grade science teacher stayed on them night and day to look at this guy’s application and give him a shot. That eighth-grade science teacher changed my life.